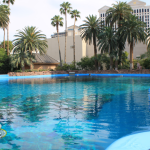 There are currently 3 pools connected with waterways, plus a med pool in the back. 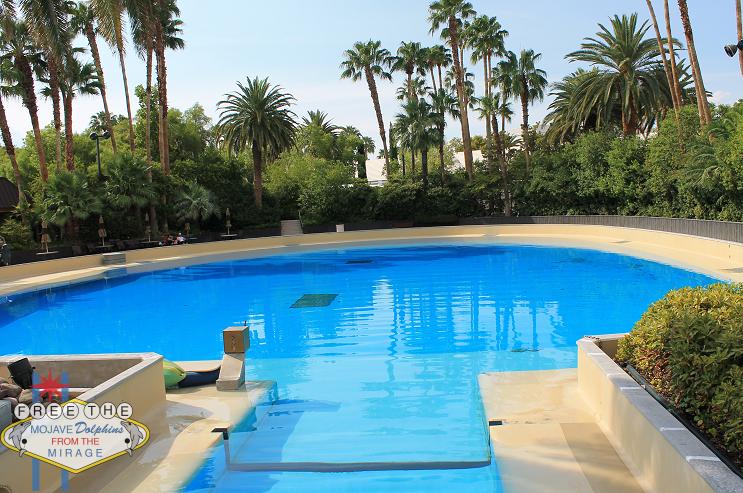 The waterways between the pools have gates to close off each section from each other. This effectively makes the passageways their own small holding cells. 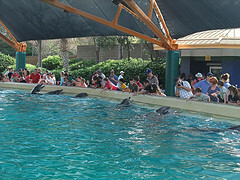 Mirage has been known to also lock the dolphins in these small channels for periods of time while training sessions go on with people who pay upwards of $600 to swim with dolphins. 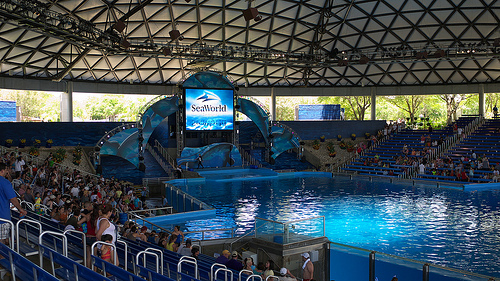 There is an underwater viewing area accessible by two different ramps. 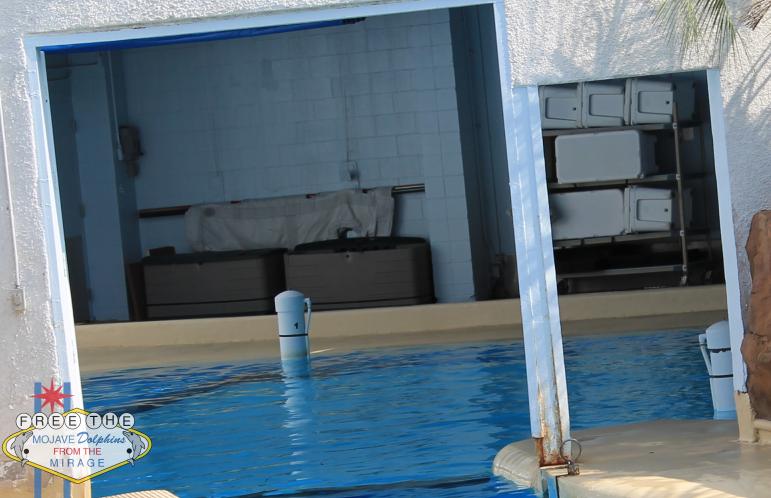 This allows you to spy on the dolphins from beneath the water. You can also hear their vocalizations. 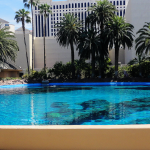 The main pool has several more viewing opportunities than the center pool, and the back pool has none. 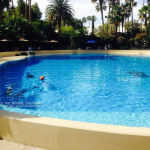 The main pool is the larger of the three pools and offers a unique fake coral bottom for dolphins to swim through and rub on. 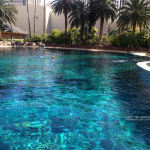 This is something dolphins may enjoy, but it makes the other two pools very barren in comparison. 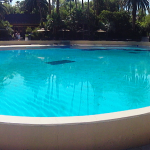 The center pool is legally big enough for 2 dolphins. 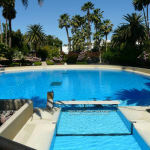 It is the smaller of the 3 pools, not counting the med pool. 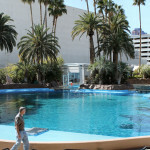 The birth and research pool, also known as the “Back Pool” was not part of the original building plans, but added after Steve Wynn realized the dolphins needed their own nursery. Animal Welfare Act regulations state under 9CFR Section 3.103(b) Facilities, Outdoor, Shelter: Natural or artificial shelter which is appropriate for the species concerned, when local climatic conditions are taken into consideration, shall be provided for all marine mammals kept outdoors to afford them protection from the weather or from direct sunlight. 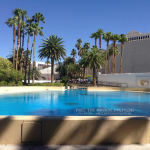 The foliage found around the 3 pools at the Mirage hotel do not provide enough protection from the harsh sunlight in the Mojave desert. Not only do we have temps reaching over 110F regularly in the summer, but nearly all of those days are days with high UV index rates. That means you are getting maximum damage from being in the sun. 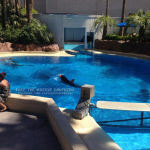 The Mirage knows this is a problem, and that is why they lather on sunscreen (video proof) every day. Even the trainers must be suffering from the heat because there has been an increase of shade structures and use of misters during the hotter months. 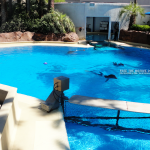 The dolphins still sit, 25 years this October (2016), without any shade. 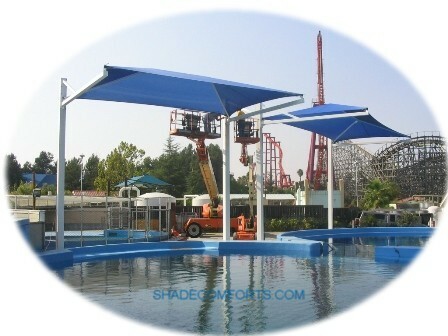 This is a simple shade structure, and it should be put up already. 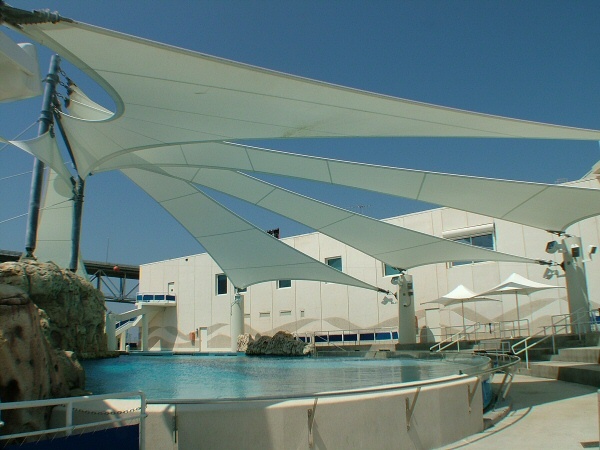 Solka Nava Torno LLC Architects in Texas participated in building a shade structure for the dolphins at the Texas State Aquarium. 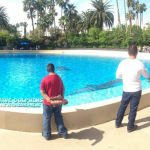 They succeeded in providing dolphins relief from the sun, while sticking with their aesthetic nautical theme. Seaworld in San Antonio, Texas has upgraded their facility to include shade structures for the killer whales and bottlenose dolphins. The Chism Company was contracted to provide this service for the animals. 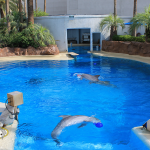 Dolphin Research Center in Florida is looking for funding to provide a much needed shade structure for their dolphins in Grassy Key. 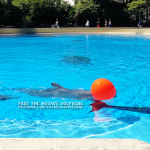 Their website openly states how they routinely have to lather on sunblock to the dolphins melons and how a shade structure is vital to their wellbeing. 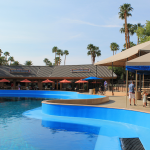 As you can see from the photos below, there is not any shade structure to provide these animals relief from the intense heat of the Mojave sun which is a violation of the Animal Welfare Act. The facility has stated in their last inspection that the shade is “under review”. 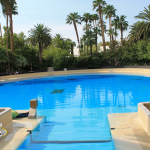 The only shade currently comes from the small trees planted around the edges which cover the pool briefly in the early morning or late evening. During the extreme UV hours of 11am-5pm, there is hardly any shade. 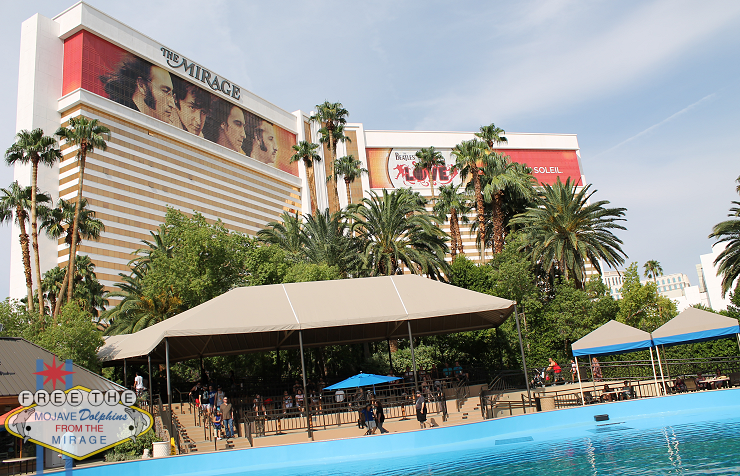 Mirage has recently installed more shade umbrellas and tents for the patrons, and also misters near the snack bar. Shade for patrons, but none for the performers who are out there all day and night. 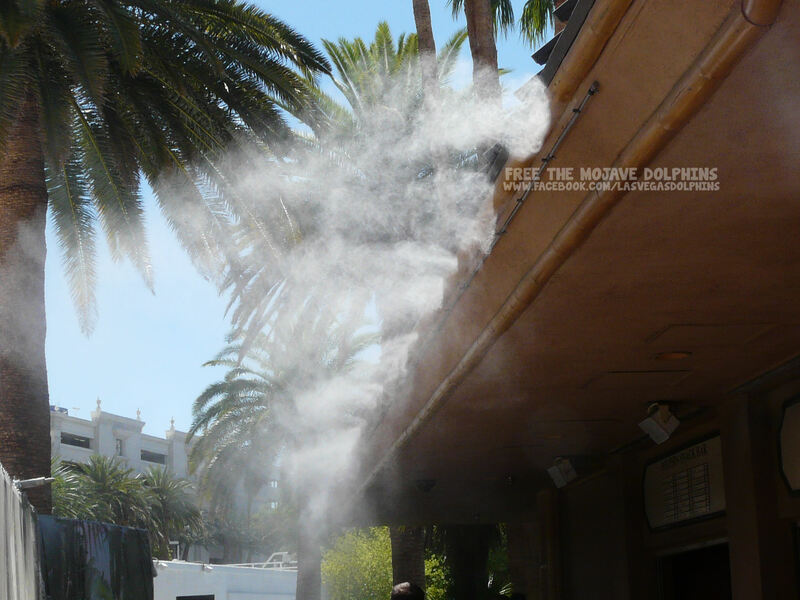 Misters near the snack bar offer brief relief from sweltering temps.